Lost River Development is the newest development in the City of Horace, North Dakota. It has beautiful views of the Sheyenne River, together with an abandoned river channel (“Lost River”) that runs through the development. 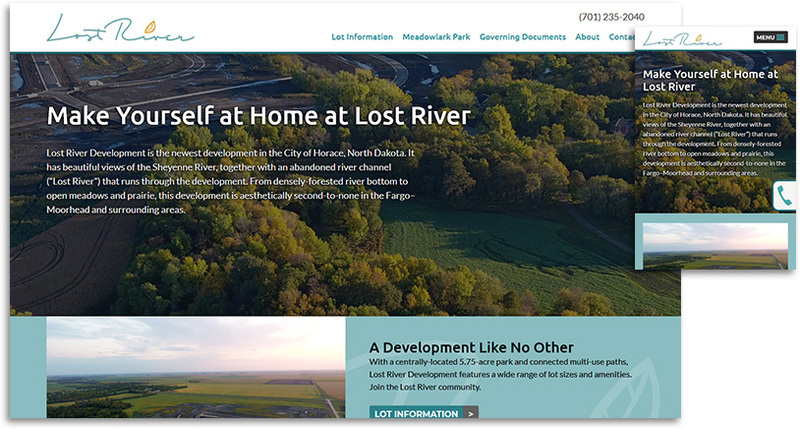 As Dwyer Law Office was already a current client, they contacted us regarding the creation of a website to showcase a new housing development, “Lost River Development”. They expressed interest in including an interactive map of the individual additions of the development to add a simple yet engaging dynamic page to the site. With some striking photography provided by the client, we worked closely with them to design a layout that highlights the natural beauty of the location while providing concise, easy-to-find information.